We all remember Patriots Day 2013. Jubilation of a Red Sox walk-off win to gloom of an unthinkable terrorist attack. 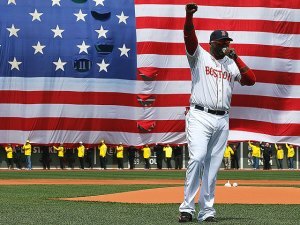 The heart and soul of Boston was punctured, but not destroyed. And the Red Sox were there to provide comfort and strength in a time of weakness and despair. A year later and Boston will remember the lives lost, the victims still living with pain and the heartache of taking one of our very own prideful moments and turning it into a dark memory. Once again, the Red Sox will be there. Before the game, the team will pay tribute to events of April 15, 2013, and the city's inspiring response. Players will wear jerseys with the word "Boston" on the front, in tribute to the strength of the city.